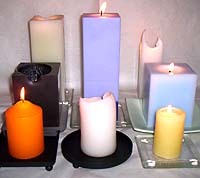 We stock a large range of glass and ceramic candle holders including those shown below. Available in two sizes and four colours as shown, cream, red, blue and black. Available in three sizes and various colours including cream, off white, coffee, pale pink, pale purple and pale green. 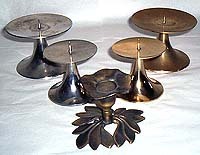 Other sizes, colours and styles are often available. Please advise us of your requirements.